Exploring beneath the surface of the Bay opens a whole new exciting world to explore. 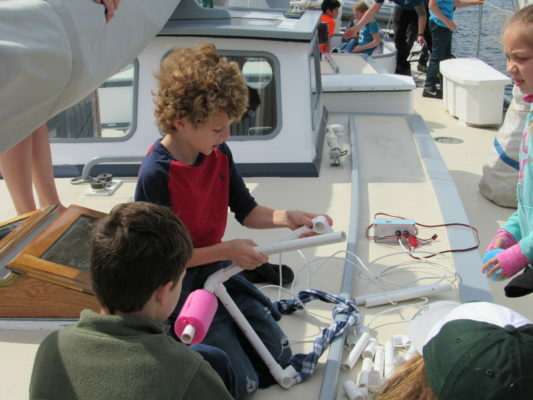 The ROV Engineer and Explore Program combines STEM concepts, teamwork, and Great Lakes career exploration into one awesome program. We can’t wait to see what your students build! Please consider bookmarking this page as you prepare. You’ll find a checklist to help you get ready as well as supporting documents including directions, a letter for home, and other important information. As always, if you have any questions, please reach out to our office at 231-271-3077 or isea@schoolship.org. Please note at this time Inland Seas does not have a pre-trip survey for the ROV program. Be clear to students that weatherproof clothing is needed. Sunscreen, hats, sunglasses, are recommended for sunny days! Be clear to students that closed-toed shoes are required. Flip-flops are not permitted. Save our Program Coordinator’s phone number for day-of-trip questions or to notify us of late arrivals. Have students complete the post-trip survey. Required if you received a scholarship. PDF available upon request. Share your thoughts with us by completing the Teacher Post-Trip Survey online or printing it here.